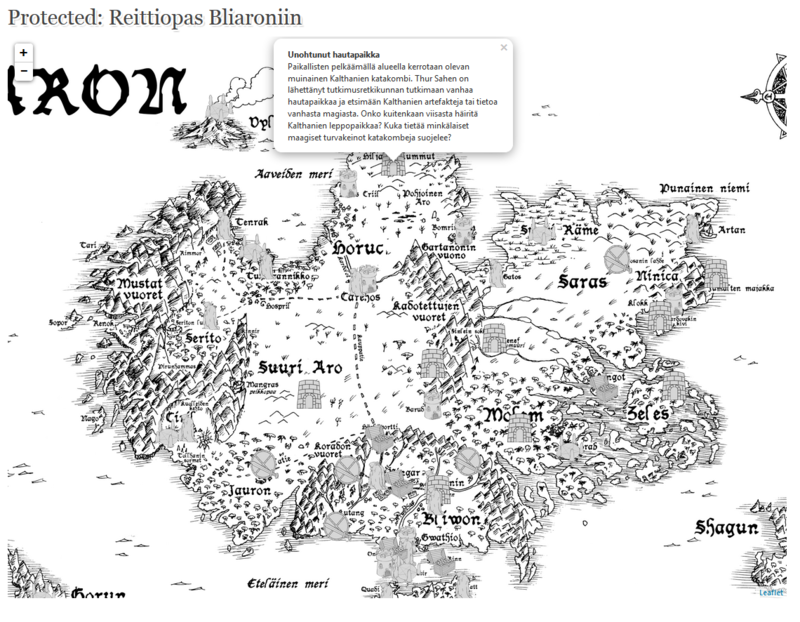 Last week me and Julius were talking of Bliaron, NR’s fantasy RPG released in Finnish language back in 2011. We were going through some development decisions, game reviews, player experiences and ended up realising that we had created tons of material that simply isn’t used at all. More importantly, we created a world with insane amounts of unique creative content, but we didn’t really do that good of a job in making all that content accessible. We had strived for a game that’s easy and accessible, but admittedly, 200 pages of Bliaron core book can hardly be labelled “easy” or “beginner friendly”. The world had tons of story hooks that we had planned, and we had deliberately left them open for game masters to use how they wanted, but the openness had resulted in blandness and we realised that many of the story hooks were actually invisible for an average user. Still, being there, free to download, Creative Commons -licensed, and full of creative material, we feel obligated to push this game forward. We really want to reach the status of easy, accessible and beginner friendly RPG. Question remained – how are we going to do this? At some point, like pokemon, a simple, but clever idea appeared. 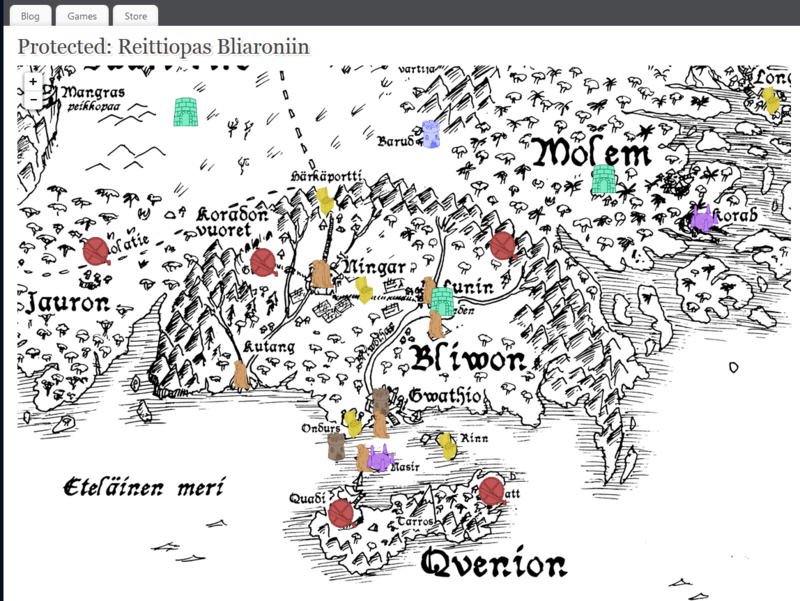 How about we created an interactive Traveller’s Guide to Bliaron, a map that presents the world, but where all of the original ideas would be developed further into mature story hooks. As a media type, interactive map is really not a novel idea, but isn’t that familiarity to public more of an advantage than a flaw? So, we got quickly really exited, and in less than a week we had a developer sketch online. At the time of writing, we’ve had our own team working hard, and got some few individuals, including of course some friends and family, involved in proofreading and getting feedback from people who aren’t as familiar with Bliaron lore as we are. Below I’ll share some developer screenshots of the map. Simple, yet seems quite effective. Note to visual-savvy readers, the icons and colours are still placeholders as we are waiting for our graphic artists to create something.. well.. better. Just a quick update on what’s going on at NR. Grim Noir has finally reached first playtesting phase. The game is going to be a film noir RPG based on christian mythology. We’re looking forward to do as much playtesting as possible during coming months. There will be more information available of Grim Noir later. On the other front Bliaron went free to download some time ago. The game is set in an iron age world of Bliaron inhabited sparsely by wild people and clansmen. Players are mages who are trying to find their way in a world that is not yet ready for them. At this moment we are interested in doing some very alpha playtesting for new edition of Bliaron’s magic system, and we are looking for gaming groups that would be interested in contributing to development by playing and giving us some feedback. Ropecon 2014 was last weekend, and our latest collaboration project called Here Be Dragons was announced. Written by J Matias Kivikangas, Here Be Dragons is a narrative roleplaying game about mighty and powerful dragons and the choices that they make. How will your dragons presence effect its surroundings and local cultures? Will the dragon have a permanent impact on the world, or will her memory fade in the passing years? You can download the demo version of the game, the character booklet and a custom scenario (written in Finnish) here: frozen.northernrealms.net/HereBeDragons. If there’s a lot of demand for the game, we are thinking about making an extended version of the game with more art, more dragon archetypes and overall prettier layout. If you are interested in the extended edition, fill out the form here. More information about the game and its development process can be found in the blog http://herebedragonsrpg.blogspot.fi/. We are proud to announce the release of Mundus RPG! In short, it could be described as an oriental action roleplaying game! The game is set on mystical world of Tentaika, inspired of Japanese history and mythology, including anime and manga art. The game system features a modular character build, detailed epic style combat system, and expansive channeling and magic system. Mundus RPG has been developed by Kajaani based game-design group that is lead by Ville Huohvanainen. Developers have a background in computer game design, yet years of experience to tabletop roleplaying. And as for side note, we also announce the opening of our webstore! Mundus RPG is now available for 15€ at Northern Realms Webstore!